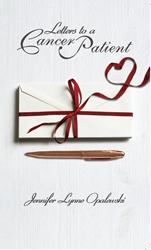 In her newly released book, author and cancer survivor Jennifer Lynne Opalewski delivers a strong and personal message of finding faith, hope, and love amid suffering and despair brought by an illness she never saw coming. Published by Elm Hill and HarperCollins Christian Publishing, Letters to a Cancer Patient candidly paints the how non-Hodgkin’s lymphoma turned her once promising and idyllic life into an erratic roller-coaster ride that threatened not only her physical existence, but her spiritual strength. “At the very least, maybe this book will give them something to take their mind off things,” Jennifer shared. “I wanted to write letters to fellow cancer patients with the hope that maybe one thing I share might help them with their own journey,” she concluded. The twenty-eight-year-old wife and young mother had a lot of wonderful things going on when life suddenly threw her a curveball that sent all sense of normalcy, including her plans for herself and her family, off track. “I don’t claim to be a doctor or therapist. I am just a twenty-eight-year-old girl whose life was turned upside down, and I am desperately trying to turn it right-side up,” said Jennifer. Through Letters to a Cancer Patient, Jennifer shares her desperate fight to live and defeat the monsters that emerged from the darkness brought by her illness. Along with many other hardships, she discusses the loneliness, fear, and brokenness. Jennifer also expresses how she and her loved ones discovered their love for one another, coupled with their faith in God, which are the strongest weapons they can wield, and their toughest shield. Publisher: Elm Hill, a division of HarperCollins Christian Publishing, Inc.
Jennifer was born in Grosse Pointe, Michigan. She was raised by two hardworking parents and at just 19, she found the love of her life, Larry. In 2014, the Lord blessed them with their daughter Cecelia. Jen’s life took an unexpected turn at age 28 when she was given her cancer diagnosis. This sent her life into a spin, but 6 rounds of chemo taught her so much about the grace of God. Her journey with cancer was not easy but it helped strengthen her relationship with the Lord. Elm Hill is a self-publishing division of HarperCollins Christian Publishing. Elm Hill’s editorial, marketing, pre-and post-press promotion and content management is provided by Accurance, a full-service book production provider ranked #1 in author satisfaction. All sales and retail distribution assistance are provided by HarperCollins Christian Publishing. Books that indicate high potential through sales will be first considered for acquisition by publishing groups part of HarperCollins Christian Publishing. For more details about Elm Hill, please call (888) 880-4403 or visit https://elmhillbooks.com.